I'm glad to know that someone is making good use of the dust in my house. This was found walking up a wall. 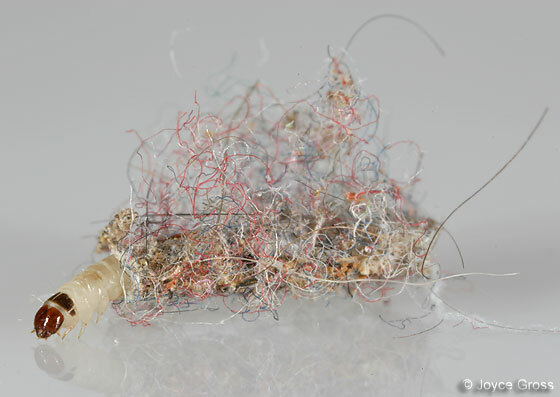 Recognize Carpet or Upholstery Fibers? There are quite a few species of these casemaking clothes moths, tapestry moths and so on, and I have never been able to find good photos on the Internet of the larvae. Maybe your excellent photo could appear on some of the useful IPM sites once you rear that critter to adulthood and determine the species. That is one fine photo! Yes, I do recognize some of the fibers by the colors... blue curtains and red flannel sheets. You're funny, Joyce, and an excellent photographer. Hey, if this is the "household casebearer," I understand they feed on spider webs. Thanks Eric -- I've didn't have spider webs on the menu, so I've added them. Plenty of those around too! In November, I have captured and raised since then a larva similar to yours. So far, it has lost 2 times its brown head cap. I look forward to the final molting. At the beginning of December, I gave the larva a dark blue fabric to eat and it became blue! I hope you're taking photos of these changes -- you take very nice photos of small things. I don't have evidence that my larva has eaten anything yet, but I'm still trying different food items. Or maybe it just isn't eating when I'm looking at it. My moth emerged today, 5 months after I captured it. Hope yours is going well. I always enjoy to see your photos, Joyce. Their beauty is outstanding. Thanks for posting your nice series -- yes, your larva looks just like mine. Mine stuck itself to the side of the container within 2 days after I captured it. So if it's still alive maybe it has pupated and will hopefully emerge soon. Based on your experience that would be at the end of the month or early next month.